You will receive a warm welcome at the international airport in Nairobi from one of our team members. 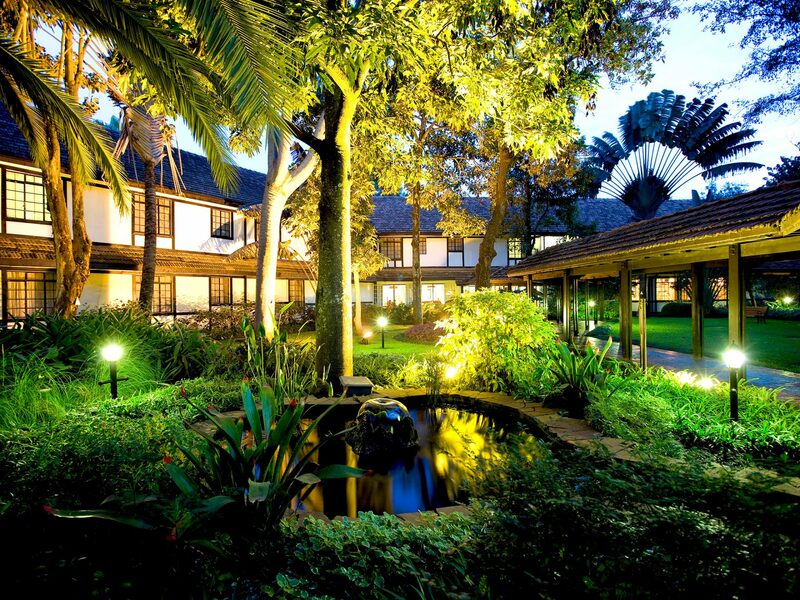 You will then be transferred to the Southern Sun Mayfair Hotel in Nairobi, your comfortable accommodation for the first night. Take some time to rejuvenate from the flight by taking a dip in the pool and enjoy the big, green gardens of this hotel. You can choose to transfer to the Nairobi Tented Camp tucked away amongst the trees of a ravine inside the Nairobi National Park. Offering comfortable walk-in tents that are authentic, spacious and semi-permanent. These give a great experience in the bush surrounded by nature with vistas of the grasslands of Nairobi. After breakfast at the hotel we will leave for Samburu National Reserve in northern Kenya. We will travel in 4×4 custom-built safari vehicles with our professional guides at the helm for the duration of our tour. We will have lunch along the way as we travel through the farmlands or at our next camp. Our accommodation will be at Elephant Bedroom Camp, inside Samburu Game Reserve which lies along the Ewaso Nyiro River providing life to the reserve. This is an intimate tented camp situated amongst the tree and indigenous bush. You can relax at camp for a bit before we go on our first game drive in the Big Five Samburu National Reserve. This is an arid area with savannah that is surrounded by mountains including the tall Ol Olokwe Mountain. In Samburu you get the chance to encounter the traditional Samburu tribe, and gain insight into their customs and culture. We will go on a sunset game drive stopping for sundowners and watching the evening colours glow all around us. Dinner will be held back at camp under starry African skies. The walk-in tents provide ergonomic comfort with small plunge pools that you can cool off in. We start the day early to enjoy the best time in the bush on a 4×4 safari in the reserve. Look out for remarkable species of the park such as the Somali ostriches, long-necked gerenuk antelopes, Grevy’s zebras and Somali giraffes. Cheetahs, elephants, lions and buffalos are frequently sighted, along with various antelopes, including striking-looking gemsbok, gazelles, waterbuck and tiny dikdiks. Lunch will be back at the camp before we head out on our next safari. The afternoon game drive is followed by free time to nap or dip into your plunge pool, and dinner at the safari camp. After breakfast we travel on the dusty roads to central Kenya and the Great Lake of Nakuru through the through the beautiful Great Rift Valley on our way to Mbweha Safari Camp, our next stop. The camp has been built to blend into the environment with stone walls and thatched roofs with great vantage points out over the Eburu and Mau mountains. Mbweha Safari Camp is located inside the Congreve Conservancy, a private reserve covering some 6400 acres of bush, along the southern side of Lake Nakuru National Park. The afternoon activities involve a guided walking safari into the conservancy where you will encounter all kinds of animals as they hunt and forage. We will return to Mbweha Camp for dinner and wind down for the day. An early morning breakfast will prepare us for a full-day game drive in Lake Nakuru National Park. Hopefully we will spot hippos, baboons, black and white rhin, giraffes, zebras and buffalo. The birds are attracted to Lake Nakuru because it is a shallow soda lake that provides nutrients to over 400 different birds. It is a birder’s paradise and a Ramsar Wetland Area. When conditions are right, Lake Nakuru is visited by large flamingo flocks – an incredible sight. Fall asleep to the sounds of nature at Mbweha Safari Camp. Wake up to the peaceful sounds of nature and enjoy breakfast before another safari to Mbweha Safari Camp. Look forward to an exciting day as we drive southwest to the Masai Mara National Reserve – one of the most amazing wildlife reserves in the world! We will drive through the beautiful Great Rift Valley into Masai country where the tribes people will greet us with their colourful robes. The Masai of Kenya are a proud semi-nomadic tribe known for their fierce warriors, ceremonies and unique dances. We reach Tipilikwani Mara Camp in time for lunch before we embark on our first 4×4 game drive in this epic East African game reserve. Wide open plains await us in this incredibly beautiful untamed Masai Mara. We return to Tipilkwani Mara Camp, set along the peaceful Talek River where we will have dinner at the camp which looks out over the acacia dotted plains. It is an exciting day in the Masai Mara today as we enjoy rewarding morning and afternoon game drives. The wilderness is rife with animals like the Big 5 and many more so keep your cameras ready! Depending on the movements of the wildebeest you may be able to see them storming across the plains, splashing through the rivers and being chased by hungry predators. You can also look out for foxes, jackals, giraffes, baboons, hippos, zebras and herds of antelopes – eland, gazelles, hartebeest, impalas and topi. Dinner will be held at the Tipilikwani Mara Camp where you can rest and have dinner beside the Talek River. After breakfast we drive back to the city and get dropped off at the Jomo Kenyatta International Airport or post-tour accommodation in Nairobi at about 13:00, bringing our wildlife adventure to a close.